French Emblems: Emblem: Exiguo contentus, potiora sperans. Content with a little, and hoping for better things. Et fatis melioribus parat se. The noisy cicada likes roses that are open And passes over closed ones, leaving them for future use. Happy in himself is he who enjoys what is available for now; And readies himself for better fortune. suos sive alabastros abditi latent, abstineant. Di questo mi contento & meglio spero. The cicada is an insect which lives by lapping up the dew (than which it has no need of any other food), and pleases itself with its song. A number of cicadas may be portrayed, flying up to and feeding off little flowers (of which different sorts could be depicted for decorative effect) which are opened and in full bloom, wet with dew; but they stay away from other flowers which still lie hidden within their alabaster-like buds. Those who are happy with their lot, however mean, enjoy good things when they get them: they are kept going the while by a generous hope either that something more may come to them through hard work, or that something may come through the generosity of princes, or that an inheritance may provide a refuge, all of which they count as gain, and as it were with integrity they avoid the clutches of the moneylenders. In this the Italian hendecasyllable is not inappropriate: Di questo mi contento & meglio spero. 1. Phalaecus or Phalecus, Greek lyic & epigrammatic poet, probably 4th century BC. 2. 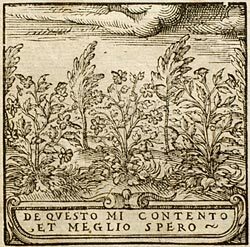 Petrarch: ‘I content myself with this and hope for better’.